U.S. Secretary of Defense James Mattis has reaffirmed solid and close cooperation between South Korea and the U.S.
Mattis said during a meeting with reporters at the Pentagon on Monday that he held talks with South Korean Defense Minister Song Young-moo on Saturday for an hour, adding there is no crack between the two allies. 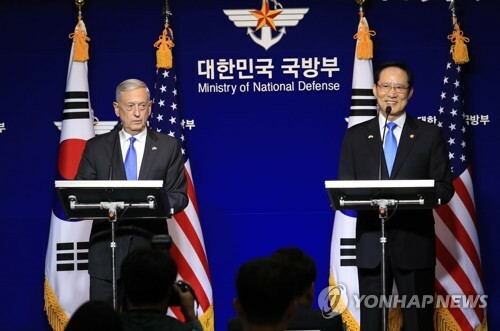 The U.S. defense chief made the remarks when asked if North Korea's latest moves indicate its efforts to drive a wedge between Seoul and Washington. Mattis dismissed the speculation, saying that the two allies are maintaining close contact and exchanges of opinion on all the details. He added that there are no signs showing the North is enhancing its military readiness. 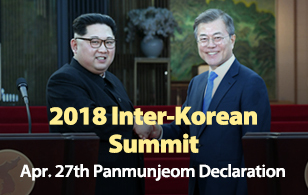 During a phone conversation on Saturday, the defense chiefs of South Korea and the U.S. expressed their serious commitment to a diplomatic resolution that achieves the complete, verifiable and irreversible denuclearization of North Korea.